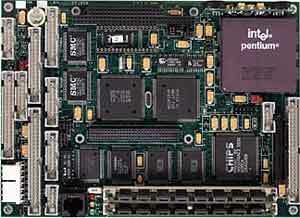 Ampro Computers, Inc.Board/P5e is a Pentium-based embedded-PC design that combines the power of a Pentium processor with the high bandwidth of a PCI expansion bus. The system meets the performance repeatability demands of a range of fixed, mobile and portable embedded applications. Additional features include a watchdog timer, a power-fail NMI generator and an on-board bootable solid state disk. The system offers two Mbytes of video Ram which supports high resolution and true-color modes for graphics-intensive applications. A PCI-based display controller interfaces with both flat panels and CRTs and offers full compatibility with five popular video modes: Vesa, VGA, EGA, CGA, and MDA. Software-programmable flat panel interface timing accommodates most LCD and electroluminescent displays.